I’m going to be moving this weekend. The weekend report probably won’t be out till Saturday night or Sunday. I’m going to be busy so answering emails will be sporadic also. This entry was posted in Uncategorized on November 26, 2010 by Gary. I posted a portfolio change to the premium website this morning. This entry was posted in Uncategorized on November 23, 2010 by Gary. 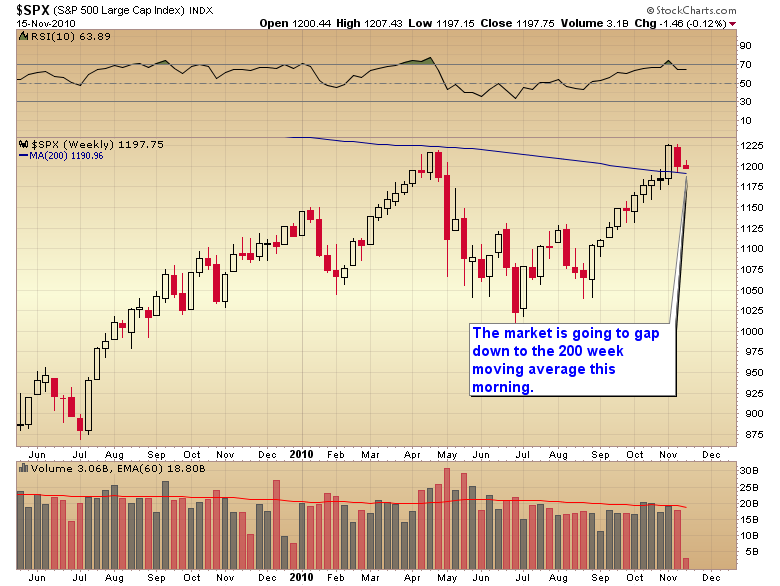 Last week the market regained the 200 week moving average. I suspect after the brief 2 day move back below that level we will see the market now hold above this major support level. Yesterday’s rally was strong enough to form a swing low and should mark the bottom of the daily cycle. I’m still expecting the new daily cycle to move back to new highs before topping in mid to late December and rolling over into a more substantial intermediate degree correction in January. This entry was posted in Uncategorized on November 19, 2010 by Gary. 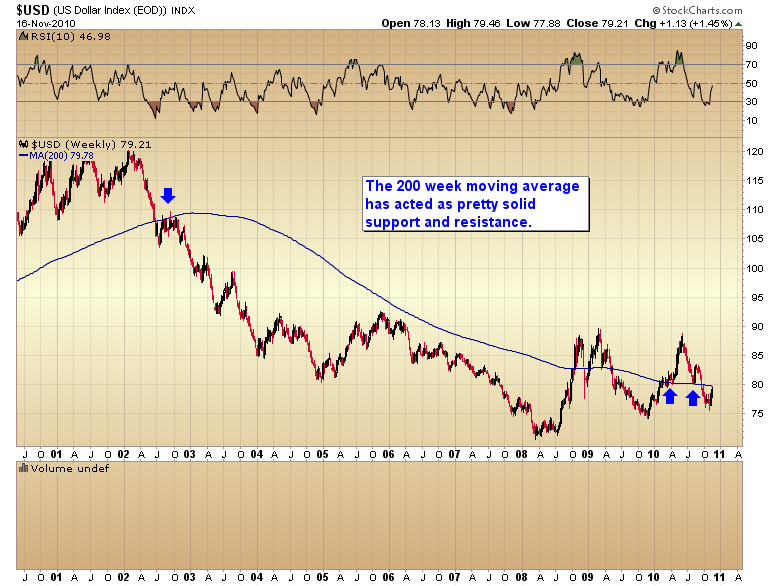 For the duration of the dollar’s secular bear market the 200 week moving average has acted as pretty solid support and resistance. The recent two week rally has now relieved the oversold conditions and in the process the dollar is about to hit the brick wall of a declining 200 week moving average. 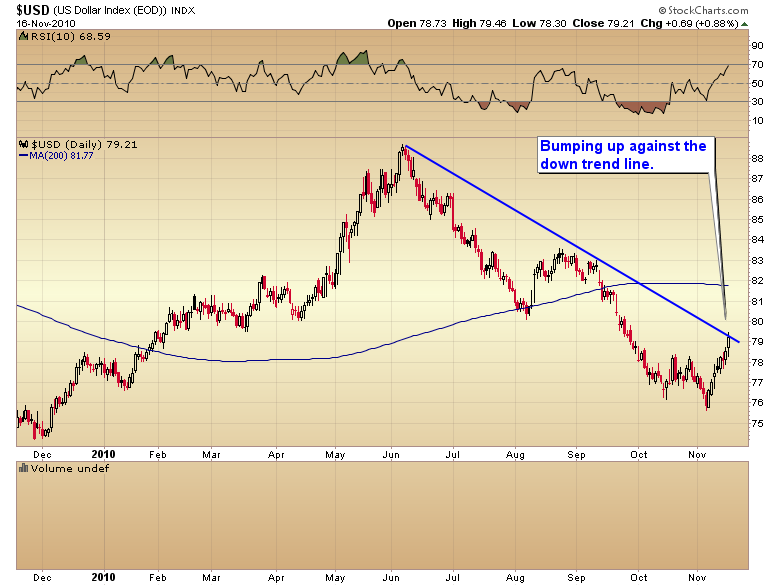 It’s already hit the intermediate down trend line. The dollar is now short term overbought, in a strong down trend, is pushing up against solid resistance, in a secular bear market, is caught in the grip of a left translated 3 year cycle decline, and in the early stages of a dollar crisis. I don’t like the dollars chances of pushing significantly above 80. As soon as the dollar resumes its collapse into the 3 year cycle low I expect we will see stocks and commodities resume their upward advance. This entry was posted in Uncategorized on November 17, 2010 by Gary. This entry was posted in Uncategorized on November 16, 2010 by Gary. If the premarket weakness holds into the open the market will gap down to the 200 week moving average this morning. In April the 200 WMA acted as resistance and turned the market down into the extended multi-month correction. 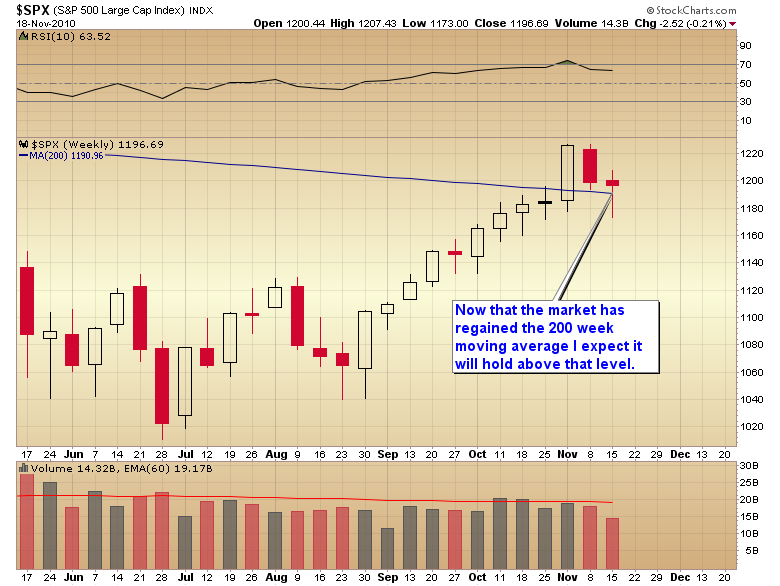 Now the market has regained that important resistance level. I have my doubts that it will spend very long below that level if at all now that it has been recovered. I’ve been harping all along on the fact that we needed to see an “obvious” correction before we could consider that we have a move into a daily cycle low. We now have it and it is taking the form of a bull flag on mild volume. Usually a bull flag will break sharply higher as it is normally a bullish pattern. 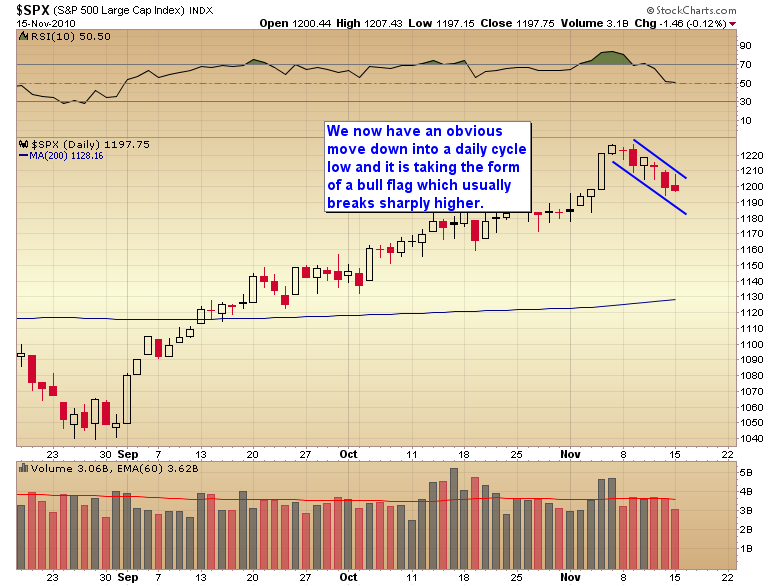 Unless we get a sharp break down out of the flag traders need to stay nimble as we could put in a bottom at any time. A swing low this late in the daily cycle will have high odds of marking a bottom. The general consensus now appears to be that all asset classes have put in an intermediate top and that the dollar has made an intermediate bottom. I jumped to that conclusion myself the other day. After further consideration I’m not buying it any more for several reasons. First, the cyclical structure of the stock market is not set up for an intermediate top unless we are on the verge of another 2 month horror show like we saw this summer. I don’t think for a second that with another 900 billion scheduled to be thrown at the market, of which 110 billion will come in the first month, that we are going to see the market roll over into an extended correction during the traditionally bullish Christmas season. 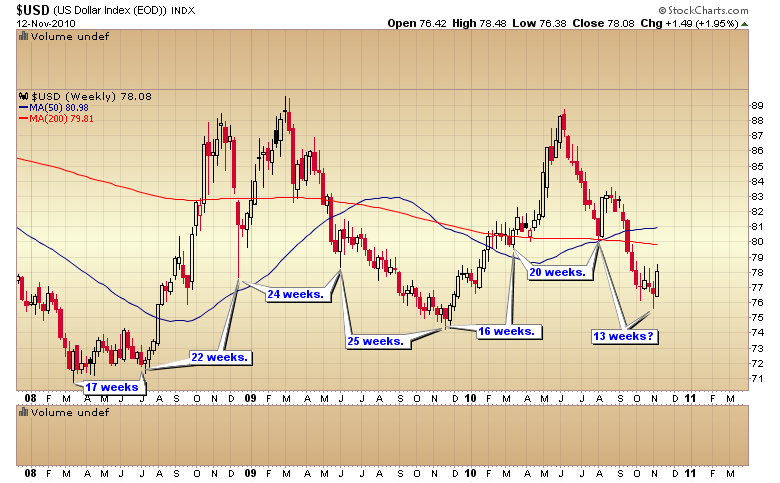 The intermediate gold and dollar cycles also aren’t set up for an intermediate top. Ever since March of `09 the Fed’s QE programs have stretched cycles, not caused them to contract. Here are the last 5 intermediate gold cycles. Every single one of them has run long except one and that one was followed by a very stretched 30 week cycle. If the current cycle follows the pattern of the last two years then it’s too early to expect an intermediate top, and the current correction is nothing more than the normal move down into a daily cycle low. Once that bottom is in place (possibly sometime next week) it should be followed by one more daily cycle higher before putting in the larger degree intermediate top. 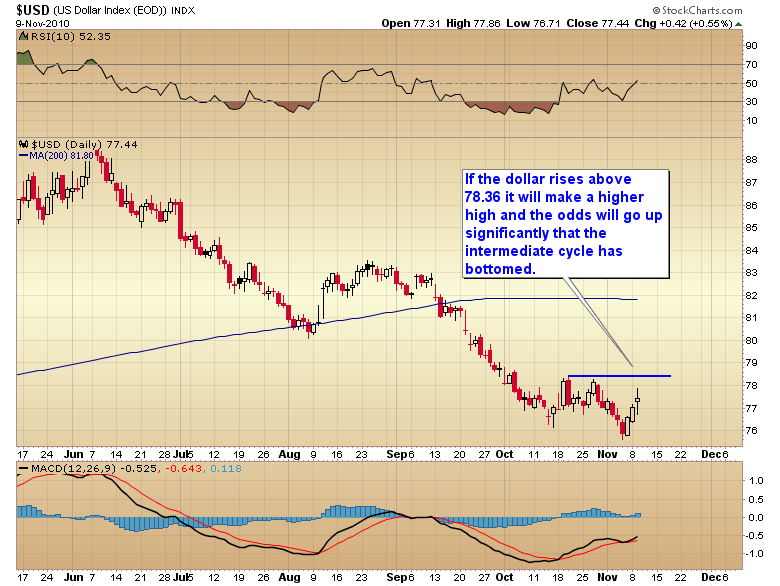 But more importantly the dollar cycle is way too short to be looking for an intermediate bottom. 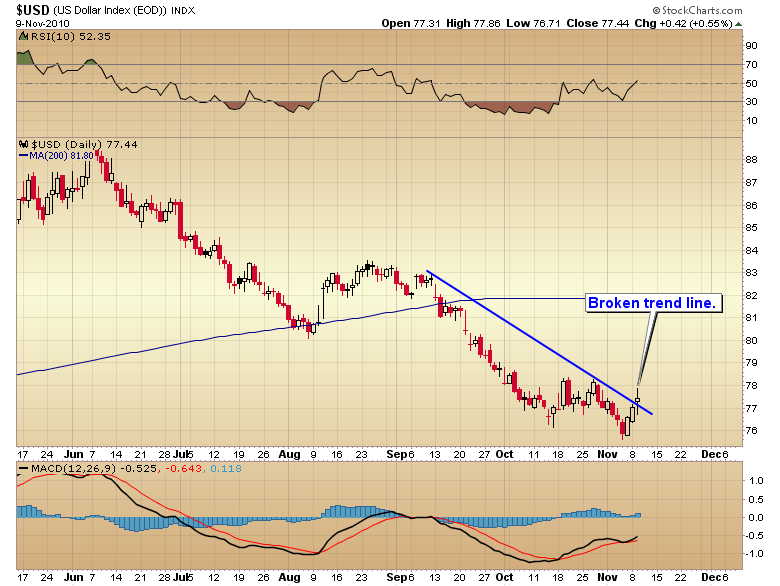 In order for stocks and gold to form an intermediate top we would need to see the dollar form an intermediate bottom. You can see in the above chart that the Fed’s monetary policy has led to normal to slightly stretched dollar cycles also. The current cycle would have to have bottomed on the 13th week. This would also have to correspond to the yearly cycle low. Now what are the odds of a yearly cycle low, a major bottom, being put in above 74, in a shortened cycle, with sentiment never hitting true bearish extremes? (The recent public opinion poll had bulls at 29% and I’ve seen it as low as 22% at prior yearly cycle lows) Pretty slim in my opinion. There is no question the dollar is now in the grip of the three year cycle decline and in the beginning stages of a currency crisis. That being the case I seriously doubt the dollar will be able to move significantly above major resistance at the 80 pivot. It’s already half way there now. If this is an intermediate bottom the rally is about to hit a brick wall that I have serious doubts it will be able to penetrate for more than a day or two, if at all. Far more likely in my opinion that the dollar rally will fail at 80 and roll over into the natural timing band for an intermediate cycle low sometime in mid to late December. This should drive stocks and gold higher into December before finally rolling over into intermediate degree corrections in January or early February. Finally, to top it off, we still haven’t seen the large selling on strength day or days that occur at virtually all intermediate tops. Until we see signs that big money is sneaking out the back door I’m going to assume the intermediate rally is still intact. This entry was posted in Uncategorized on November 13, 2010 by Gary. For some time I’ve been of the opinion that the dollar will control the fate of not only the stock market but also our favorite bull market…precious metals. Since June the dollar has been collapsing down into a yearly cycle low. I didn’t expect that low until the dollar reached at least 74 and I thought it even more likely we would see 71 before the cycle bottomed. 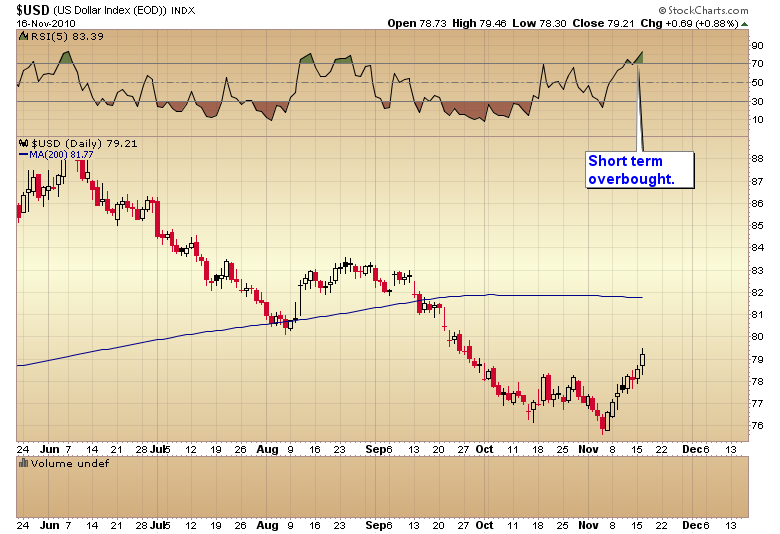 However yesterday the dollar threw us a major curve ball. What should have been a minor bear flag that would resolve with a downward break has gotten unexpected traction. Yesterday the dollar broke the down trend line and it now appears clear that the dollar has formed a shortened daily cycle low. If the dollar rises above 78.36 it will reverse the pattern of lower highs and the odds will rise significantly that we now have a shortened intermediate cycle bottom, which should also mark the yearly cycle low. If that turns out to be the case then we can probably expect stocks and gold to turn down into an intermediate correction. 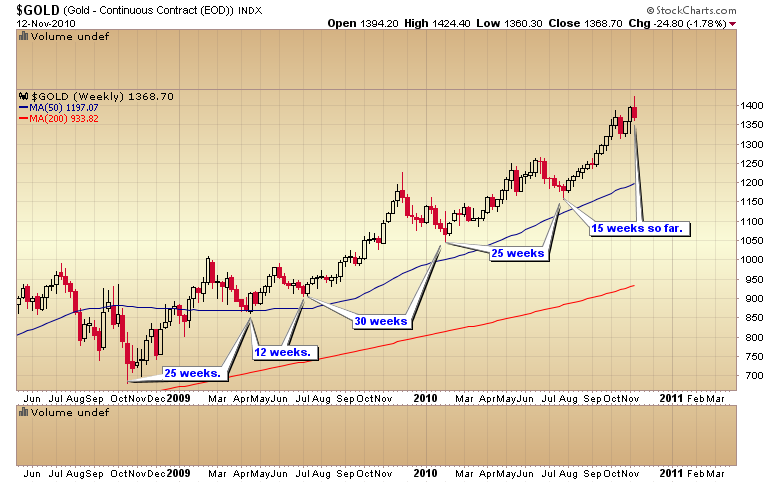 The gold cycle is a bit shorter at 15 weeks but still in the timing band for a top. 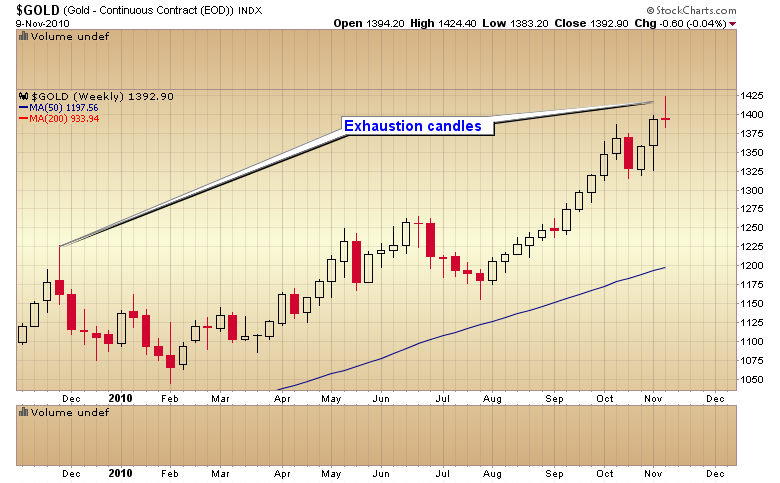 If we end the week about where we are today then gold will form an exhaustion candle on the weekly charts. This is why traders can’t leverage themselves to the moon. These curve balls happen. If you get caught by one of these and you are leveraged to the max you will do catastrophic damage to your portfolio. Trust me when I tell you this. Massive leverage always ends in a blown out account. There are never any exceptions to this rule. Never! This entry was posted in Uncategorized on November 10, 2010 by Gary. Everyone might as well resign themselves to the fact that the SMT will be posted only to the website from now on. Every newsletter I’ve ever subscribed to is done this way and now I see why. There comes a point when it just gets too big to be sent as an email. The SMT has reached that point. When I started this I had no intention of spending anywhere near as much time at this thing as I am. I’m retired and I fully intended to enjoy my retirement. I realize I’ve made my bed and now I have to lie in it, but I can tell you I’m going to do everything I can to make this easy on me. And right now that means the nightly emails are done. I’m going to write the nightly report once and post it on the website. I will tweet when it is posted so everyone doesn’t have to constantly check the site. However 90% of the time the report will be up by 6pm PST. 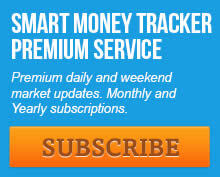 Subscribers can just go to the site at 6 and usually find the report ready to go. Intraday posts are pretty rare and even if you don’t get the post till the evening it usually isn’t going to make much of a difference whether you acted immediately or the next morning. But for those of you who think you have to react instantly I will tweet when I post an intraday alert. Most of the time they come premarket, so you could always just check the website before the market opens. Now for anyone who is having trouble logging in. 90% of the time you have caps lock on. The other 10% you put the username in the password prompt and vice versa. To make it easier the username will never change and it is very easy to remember. All you have to do is save the password on Sunday night when I send it out (perhaps on a sticky note on your computer) . If you loose the password email me and I will get back to you as soon as I can with the password for the week. That’s it. Now let’s turn off the grumbling and get back to investing. I’ve been in an almost constant battle with my email server now for the last couple of weeks. For some reason their system is set up to recognize bulk emails as spam. So when I send out the nightly report it occasionally triggers their system to shut down my outgoing emails for several hours. After a 5 hour ordeal on the phone Saturday attempting to get the weekend report out, it has become painfully obvious that the nightly alert has become too large to continue as a mass email. So from now on the reports will only be posted to the website . You can still send email questions to me at the usual email address, but this too is starting to overwhelm me. So from now on I can’t guarantee I will be able to answer every email. If you have general questions you can always post them here on the blog. I will try to have the nightly report posted to the website by 6pm PST but occasionally if I’m out climbing it may be later than that. Most days it will be up by 3pm PST. This entry was posted in Uncategorized on November 9, 2010 by Gary.